American Academy of Pediatrics, 9781581108965, 150pp. This portable pocket guide to baby basics fits in a diaper bag or stroller pocket, making it a great resource for on-the-go moms and dads. 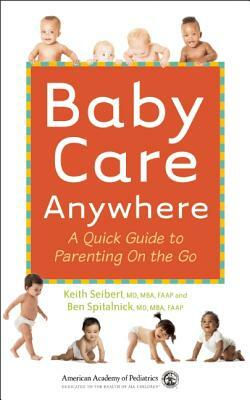 Written by two pediatricians, Baby Care Anywhere addresses 150 of the most frequent questions and concerns raised by new parents. Covers picking a pediatrician, jaundice, diaper rash, earaches, immunizations, sleep, reflux, fever, and much more! Benjamin D. Spitalnick, MD, MBA, FAAP, is a partner in Pediatric Associates of Savannah, Georgia.